If you need an emergency appliance repair in the Wilbraham, Mass., area, call L&W Appliance Service for fast, reliable service. We repair most major brands of household appliances. We repair ranges, washers, dryers, refrigerators and more. We offer emergency repair services in order to get your appliance back up and running. We fix many major name-brand makes and models. Our service technicians have years of experience working on major brands like Kenmore, Amana, KitchenAid, MagicChef, and Whirlpool. Our trucks come fully-stocked with OEM, manufacturer parts for a quick appliance repair. We have been servicing Wilbraham and the surrounding communities since 1980. We provide superior and fast service, so you can get your broken appliance fixed quickly. Give us a call today to schedule your appointment. A burst washing machine hose can cause catastrophic flood damage to your home. Check the connections and the condition of your washer fill hoses on a regular basis. 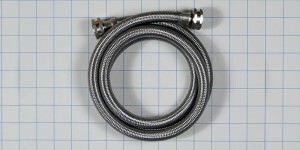 You might want to consider upgrading to stainless steel washing machine hoses which are more resistant to bursting. Wilbraham is a town in Hampden County, Massachusetts, and is a suburb of the City of Springfield. It is considered part of the Springfield Metropolitan Statistical Area. The population was 14,868 as of the 2010 census.